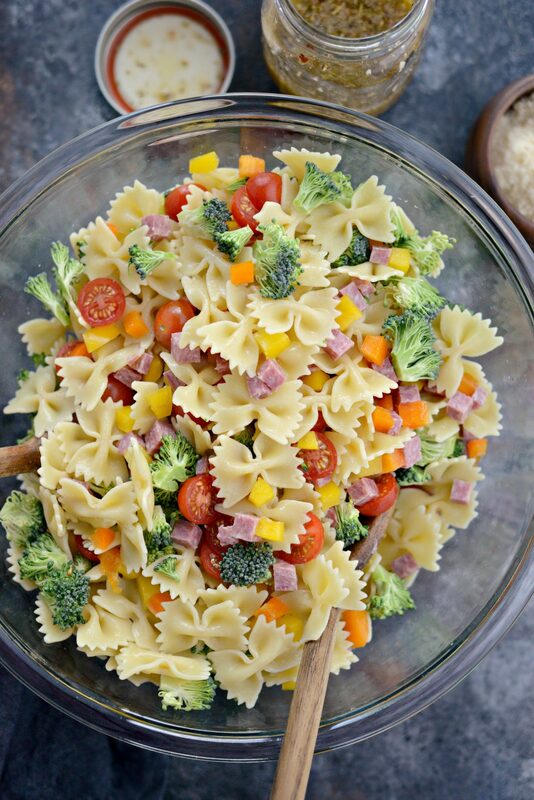 Colorful veggies are tossed with bowtie pasta, Genoa salami, Parmesan cheese and a super simple Italian dressing for the ultimate Italian Bowtie Pasta Salad! 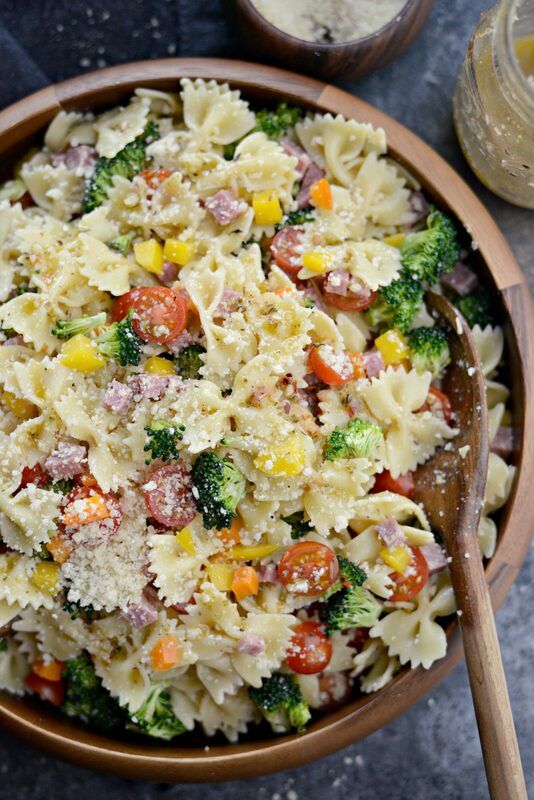 This pasta salad calls for simple ingredients, takes little time to whip up and absolutely delicious! This past weekend I spent from sun up to almost sun down at Malloree’s softball tournament. It’s an all day affair of watching games of softball intermingled with sometimes lengthy breaks in-between. All of us parents sign up to bring something and contribute to lunch for the group. One of the parents brings his charcoal grill and will cook something fantastic. There’s something about the smell of a charcoal grill that puts a gas grill to shame. On Saturday he grilled marinated pork chops and there was also biscuits, a green salad and one giant bowl of colorful pasta salad. Needless to say, this bowl of carb-heaven got my wheels turning and inspired the recipe for this post. 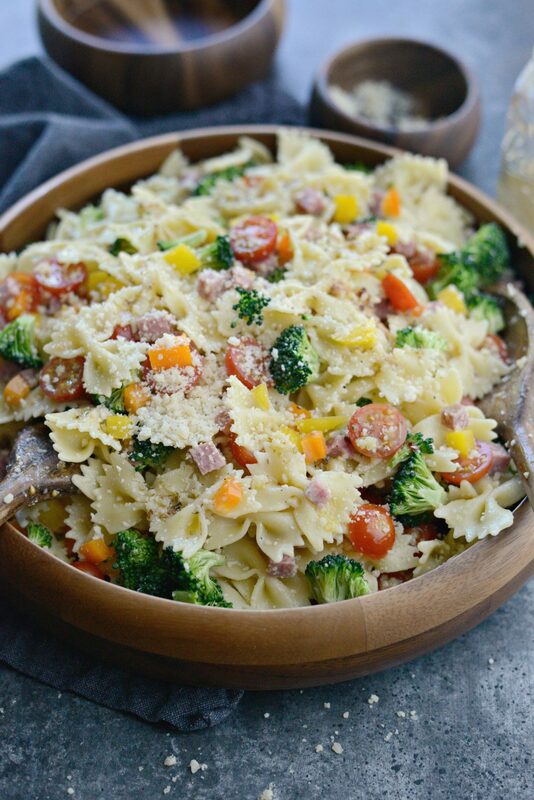 I have always been and will forever be a pasta salad fan. How can anyone not be? 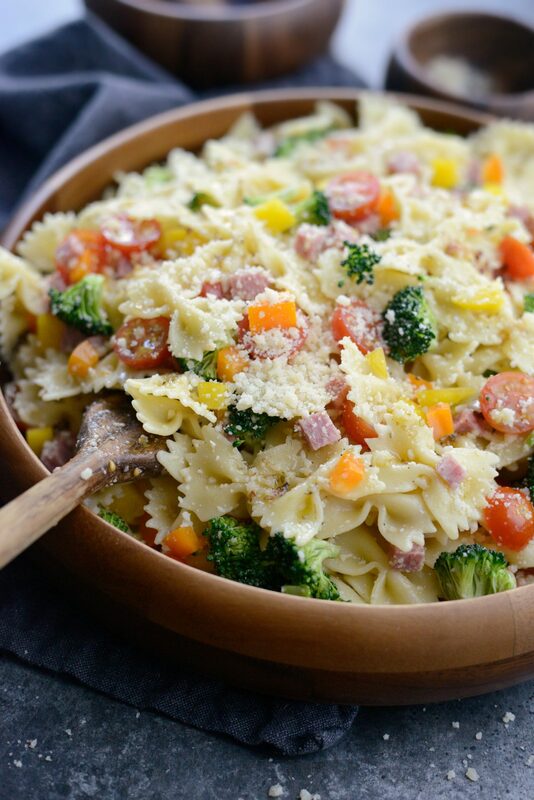 If you’re gluten sensitive, there’s lots of gluten-free pasta that can be used instead. Hallelujah! 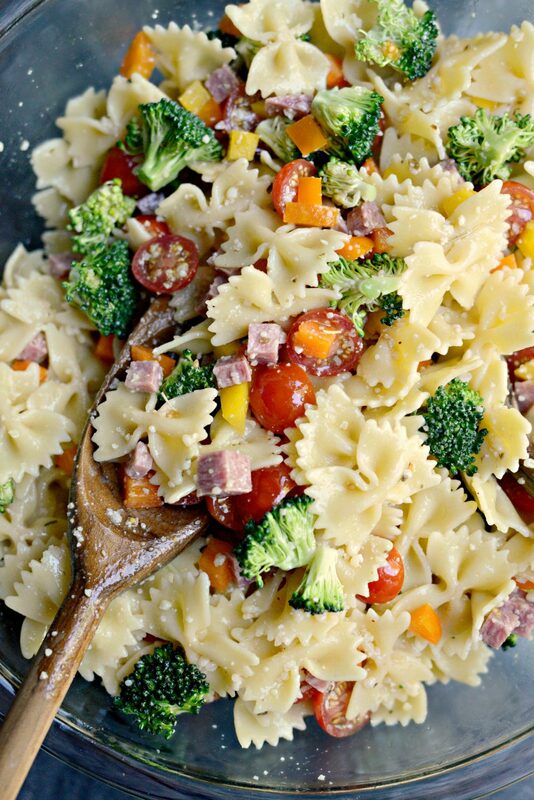 Since this Saturday, I couldn’t stop thinking about pasta salad. 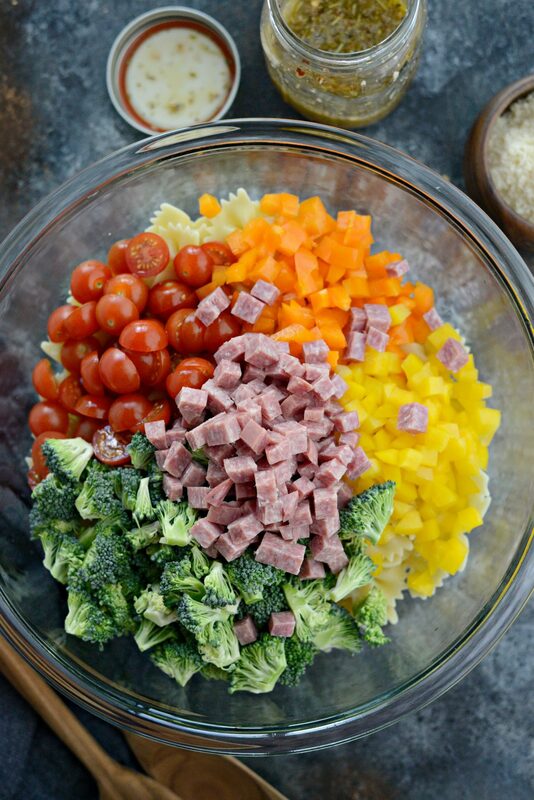 Colorful veggies, Genoa salami and a quick and simple homemade Italian dressing stalked my waking thoughts until I could get home and make it and eat obscene amounts without any judging eyes. If it was up to me, I SO would’ve grabbed the bowl and ate.it.all. 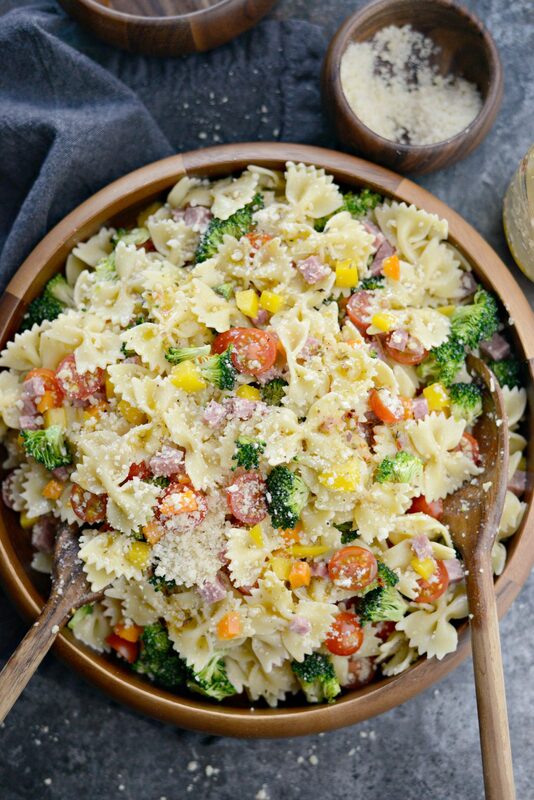 In my Italian bowtie pasta salad you will need, cherry tomatoes (I like these so much better than grape tomatoes, but feel free to use those too), both yellow and orange bell peppers, a small broccoli crown, Genoa salami and shard of Parmesan. 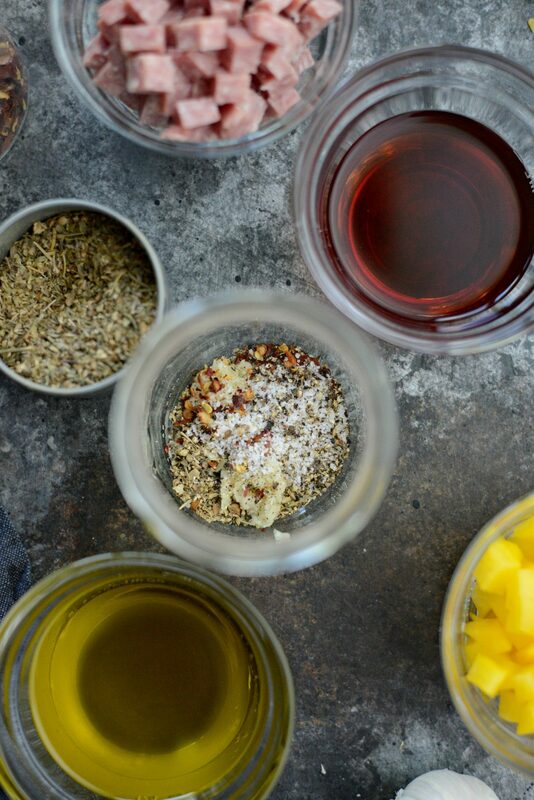 To make the simplest of Italian dressings, you will need; 1 good size clove of garlic, Italian seasoning, red pepper flakes, salt and pepper, olive oil and red wine vinegar. First things first bring a large pot of water to a boil. 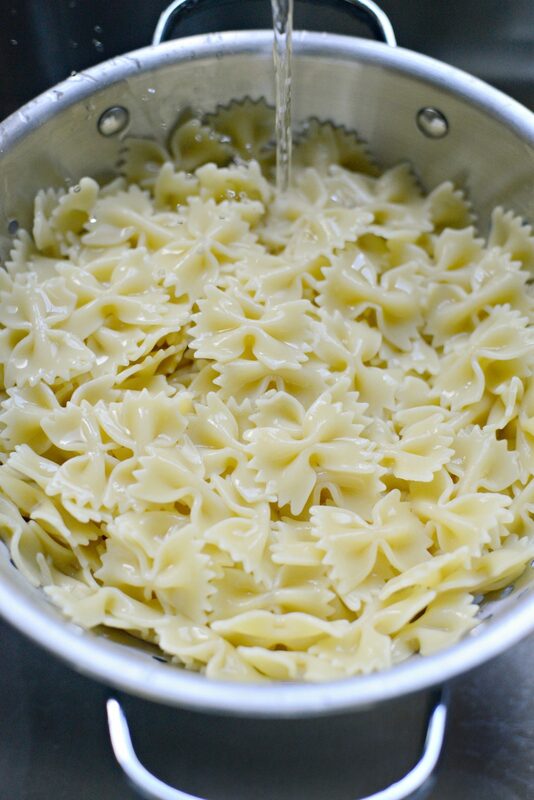 Once at a rolling boil, add in a good heaping tablespoon and give it a stir before adding in 12 ounces of bowtie pasta. Follow the instructions on the package cooking the pasta until al dente. Then pour the cooked pasta into a colander thats set into you sink and drain the pasta. Rinse with cold water to stop the cooking and cool down the bowties, toss every once and again with a spatula to drain properly. 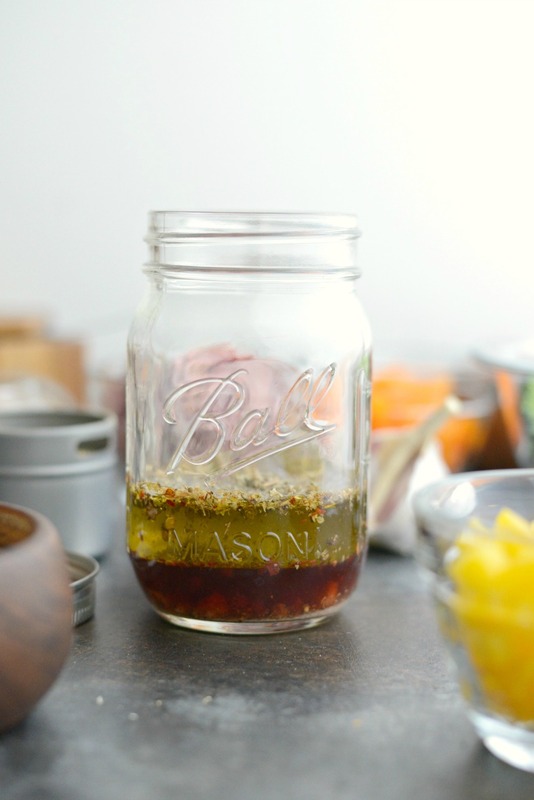 In a glass jar or container with a tight-fitting lid, grate in a clove of garlic. 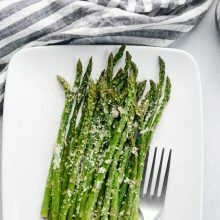 Measure and add in 1 teaspoon of Italian Seasoning (<— my homemade recipe can be found in my cookbook), 1/2 teaspoon of red pepper flakes and I add about 1/2 to 3/4 teaspoon kosher salt and 1/4 teaspoon freshly ground black pepper. However, taste and season to your preference. Next, pour in 1/4 cup of red wine vinegar and 6 tablespoons of good quality olive oil. Secure the lid tightly and shake until combined. While the pasta is cooking and then draining, dice 1/4 of a pound of Genoa salami into small pieces. Then dice the peppers, section the broccoli into small bite-size florets (removing most of the stem if you want) and slice the cherry tomatoes in half. 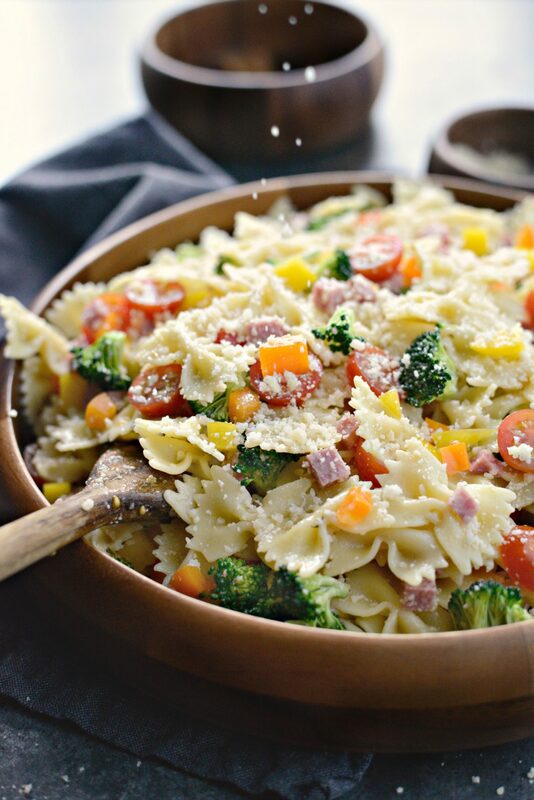 Add all those colorful veggies into the bowl of cooked and cooled bowtie pasta, giving it a quick toss. 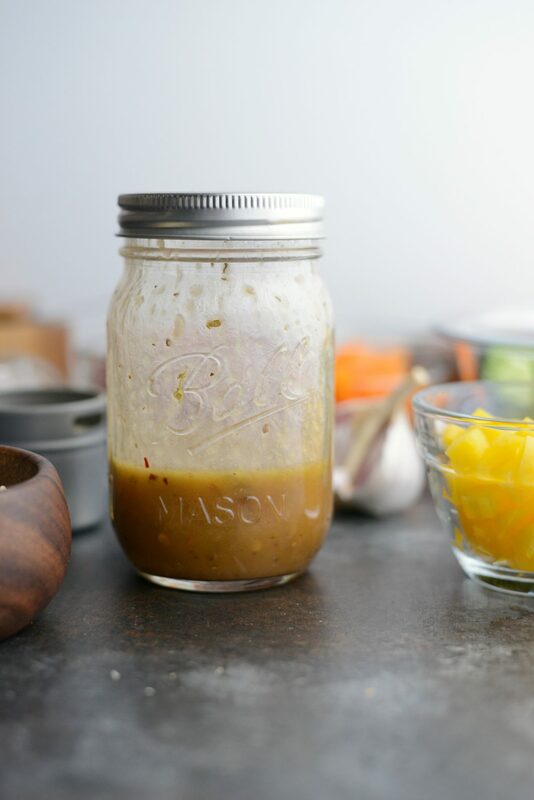 Pour in half of the dressing, toss and give it a quick taste to check for seasoning, adding a pinch or two of mores salt as neeeded. 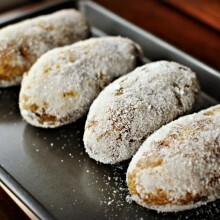 Then cover tightly and refrigerate until ready to serve. 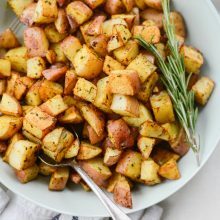 Right before serving, I toss it with the remaining dressing, a few grinds of black pepper and a sprinkle or seven of extra crumbled Parmesan cheese. Bam! 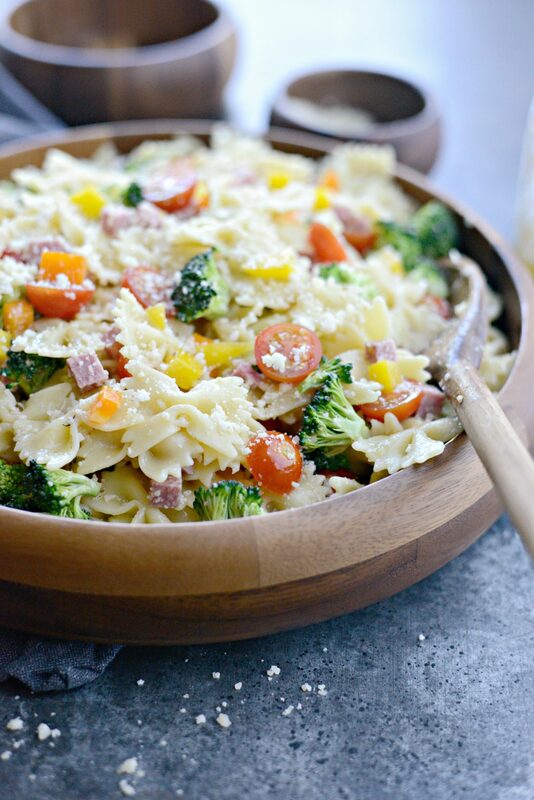 The absolute BEST Italian Bowtie Pasta Salad! 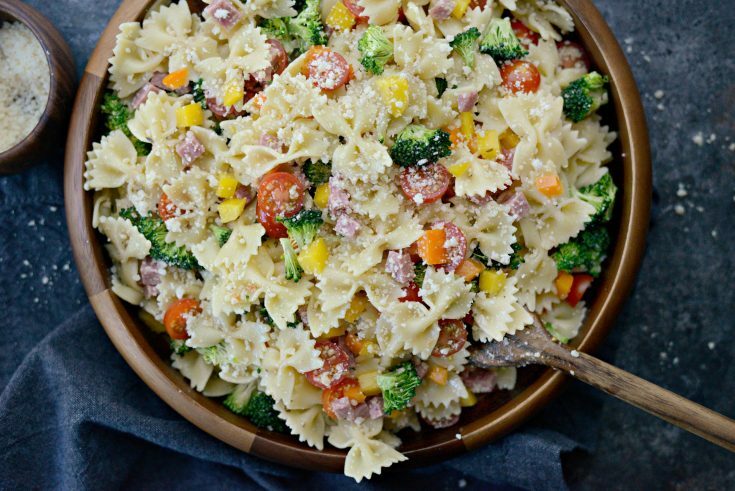 This Italian bowtie pasta salad is excellent and loved by every single soul in my household. 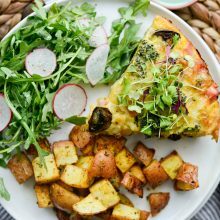 Even though both my kids pick out the tomatoes — which happen to be my favorite part– I forgive them and then make them add their tomatoes to my plate. 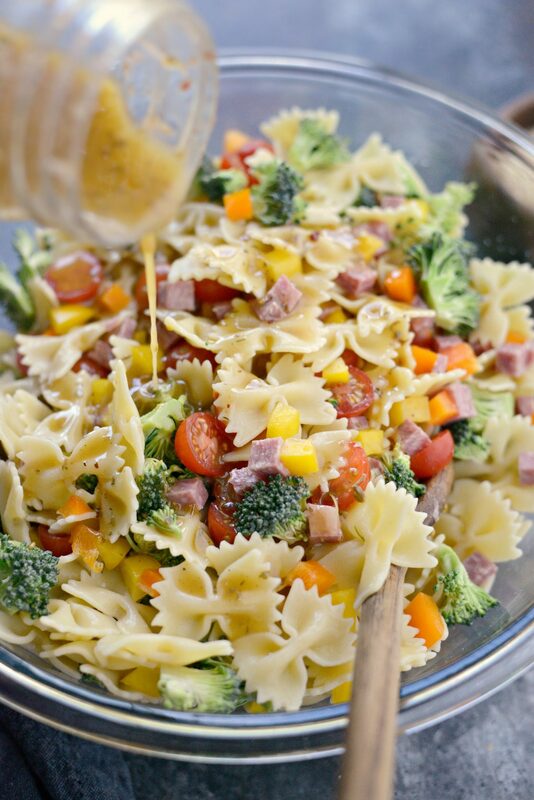 This pasta salad is colorful, delicious, homemade with love and easy. If serving a large party, consider doubling it otherwise this salad feeds about 8. I make it for us four and we have it with grilled chicken. 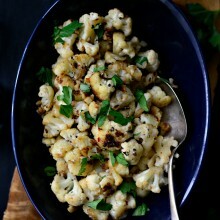 It’s light and bursting with fresh flavors! Enjoy! 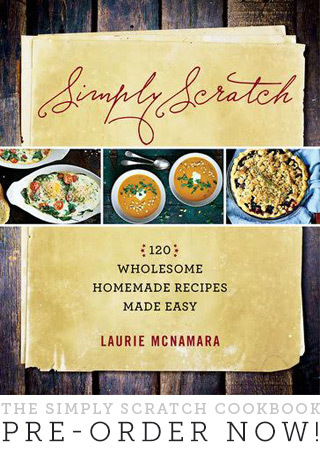 And if you give this recipe a try, let me know by snapping a photo and tagging me on twitter or instagram! Secure the lid and vigorously shake to combine. You will need to shake again before using. 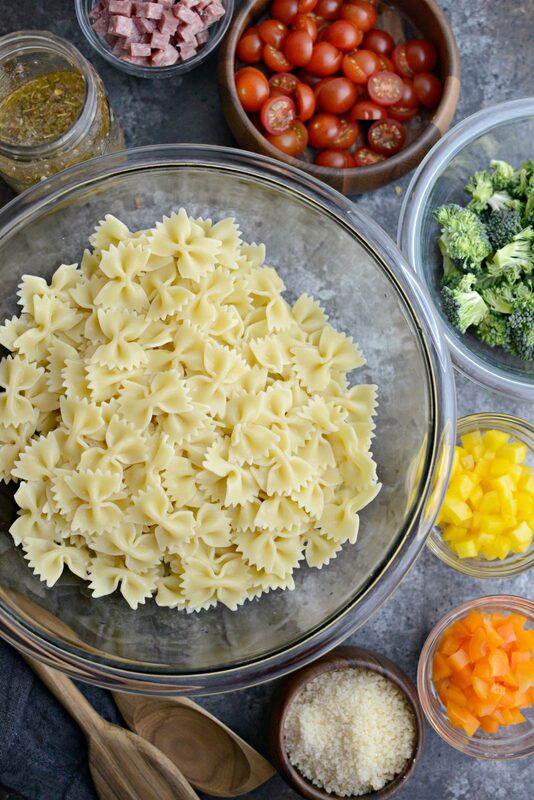 Bring a large pot of water to a rolling boil, stir in 1 heaping tablespoon of sea salt and add in the dry pasta. 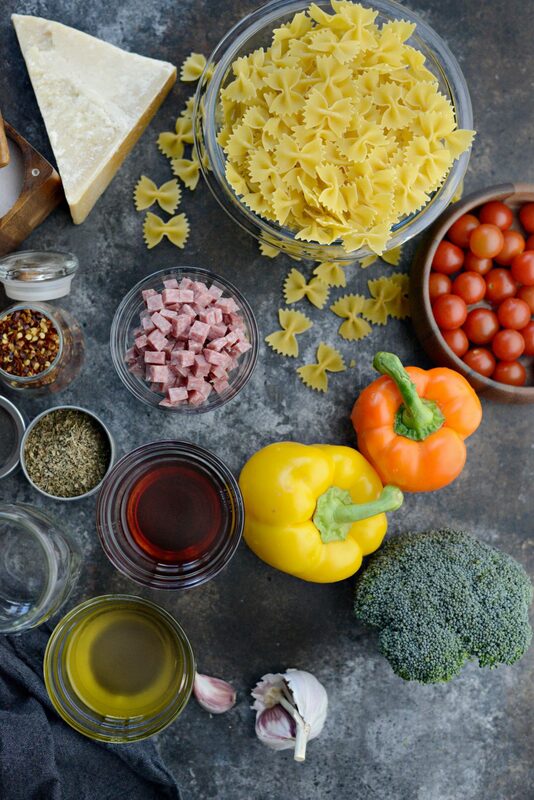 Follow the package directions and cook accordingly to al dente. Drain and rinse with cold water. Taste test for salt, adding more if needed. Then cover and refrigerate until ready to serve. 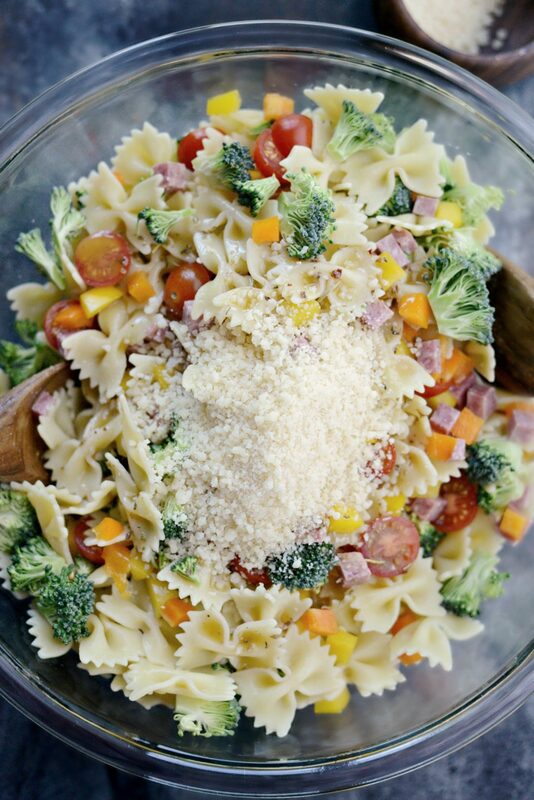 Right before serving; I pour in the remaining Italian vinaigrette, a few turns of fresh black pepper and sprinkle about 1 to 2 more tablespoons of crumbled Parmesan over top. Holy yum! 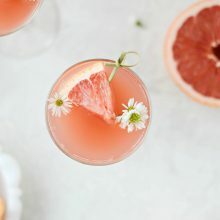 Will be adding this to our Memorial Day Weekend menu!